"Orange Medal" token, awarded by Slaporte. "Like" token, awarded by Steinsplitter. NOTE: Since the creation of this report, statistics on session loss are available to monitor progress. became way more frequent. I didn't change my editing patterns, for instance I'm not waiting between action=edit load and submit time more than I used to be, so the issue is server side. I saw multiple reports of this feeling around, on IRC and at least two wikis. There were many changes related to caching recently, so that's the most obvious suspect. Aside from the annoyance and productivity loss, the most obvious damage is that an unknown amount of edits go lost forever (when editors do not notice the edit was not saved). T102588: Frequent "Sorry! We could not process your edit due to a loss of session data." Oh. Probably related: https://edit-analysis.wmflabs.org/compare/ "failure rates by type" shows that "bad-token" errors doubled from 2015-06-04 to 2015-06-06. There was no improvement in recent days. I wonder whether it has anything to do with @aaron's change for T102928. "It" what? That was after this bug, in an attempt to improve things. This bug. If something became worse in the last few days it may or may not be related. I can't find much before 2015-06-06 in core: 5b2670b31b913a43bc98ea6d1a74e13a5de0237a, 5399fba68b99d2a4fb3ec681fd4d426ca9739a1a, 833bdbab37cda3fabe8b69067bf1637a301c6af5. I agree with Amire80, this is getting significantly worse. I made 13 edits and performed 13 checkusers between 0056 and 0415 hours UTC today (July 8). Of those, all but two of the edits failed on the first attempt, and at least 5 of the checkusers failed on the first attempt (usually when doing a second check but switching checking parameters). I am concerned that new users in particular may become frustrated and abandon attempts to edit. Yeah, 3% is pretty high for this issue (historically it's been ~1–2% for VisualEditor users), but from our end it's unclear what's caused it; our investigations have not found anything useful, and in particular I've not been able to reproduce it. I havn't seen this bug, when I used the "preview"-button on one of the open browser-tabs before clicking the "save"-button in the other tabs. → The preview-button is a work-around. I've also brought this up on WMF's engineering mailing list. Just happend to me (16:15 CET) on https://nl.wikipedia.org/wiki/Wikipedia:Te_beoordelen_pagina%27s/Toegevoegd_20150714#Toegevoegd_14.2F07:_Deel_1. I edited a text and immediately pressed save without previewing. Pressing save after getting the error message and the text got saved. We would've lots of other unreported occurences of this and newbies (and regular users) not knowing what happened and thus losing constructive edits... Raising priority. Memcached is still used for this stuff, right? Is this trend in mc_evictions on memcached servers normal? It seems to get faster around the end of May. Aklapper mentioned this in T104795: Frequent session data lost. Aklapper added subscribers: zhuyifei1999, Andyrom75. Possibly fixed by restart of some misbehaving memcache servers (T106066#1458967). Just before in [[de:Veröffentlichungen_von_WikiLeaks]], [[de:UN-Klimakonferenz_in_Kopenhagen_2009]] but not in [[de:Klimaskeptizismus]] some sekondes before. "preview" is no longer required, a seconde "save" is enogh now. The frequenz of the issue declined. Ciencia_Al_Poder added a subscriber: AdamCuerden. Unless I'm misreading them, the statistics already confirm the severity of the issue: Wikipedias have about 4 edits/second (cf. 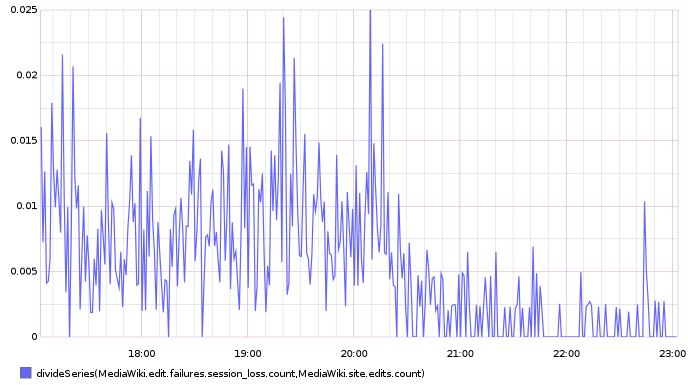 editswiki which became en.wiki-only) and the logging counts 5 session failures per second. No improvement recently. ori mentioned this in rMWc72b7c435f00: Debug logging for T102199 (take 2). ori mentioned this in rMW160f69871cea: Debug logging for T102199. Based on log data from 2015-07-30 21:06:41 UTC - 2015-07-31 04:52:37 UTC, representing 1,301 errors. [palladium:~] $ sudo salt --out=raw -b25% -t60 -G 'deployment_target:scap/scap' cmd.run "grep -c 'error [^0]' /var/log/nutcracker/nutcracker.log"
Revert "Set $wgAjaxEditStash to false, on suspicion of being implicated in T102199"
Memcache / Redis hosts on the A5 rack represent only a third of the Memcache / Redis cluster but they are conspicuously overrepresented in the error logs. There are most likely two distinct issues here. The first is the subtle but longstanding fault in network equipment, shown in the graph above, and now tracked in T107635. 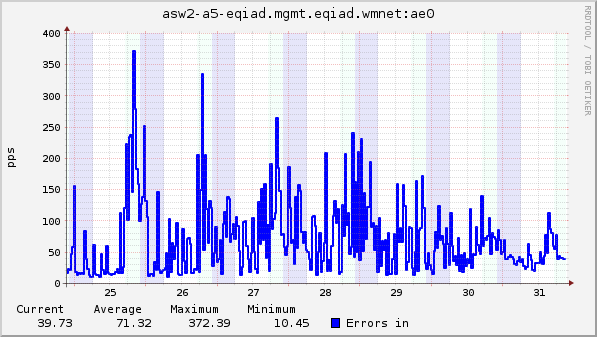 This fault is plausibly causing occasional session loss errors, but it cannot explain any recent spike in such errors, if indeed there is one. The second issue is a software defect somewhere in MediaWiki that is causing sessions to expire more quickly than we want them to. I haven't isolated this yet, but rMW646fdc9 and rMW532ef78 look suspect. The instrumentation that produces the data for that graph is likely underreporting the magnitude of the problem, because it is not consistent with what editors have been reporting. But it is probably underreporting by some constant factor. So the decline in errors that we're seeing is substantial and real. @Nemo_bis, @Boshomi, @Risker, @RicoRico, @Rich_Farmbrough -- are things better now? Hello Ori - Since the change you made, I have had NO unexpected losses of sessions. This is a massive improvement, as I was verging toward 90% on checkuserwiki when I had the page open for as little as 2 minutes, and 100% if open more than 10 minutes. Yeah, 'badtoken' events have gone down very significantly for VisualEditor (and so I imagine even more so for wikitext editor, which has a much worse user outcome when it fails): https://edit-analysis.wmflabs.org/compare/ (narrow the date range to 2015-07-27 – 2015-08-02). Down from ~ 5% (and so 1/3rd of all edit failures) down to 0.9% today. Should we consider this fixed? @ori thank you for investing so much time in this !